Awaken your walls with a real action-packed battle scene between good versus evil with this Star Wars Vehicles XL Wallpaper Mural by RoomMates Decor! 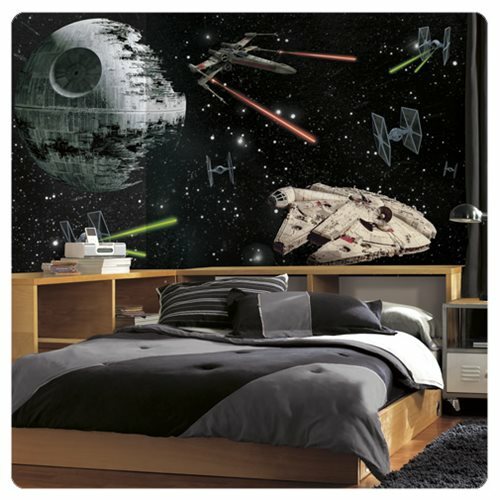 Featuring a thrilling battle between the legendary Millennium Falcon Starfighter and TIE Fighters, bring full throttle energy to any room the minutes you install this exhilarating wall mural. Great for Star Wars fans of all ages, assemble at your very own speed with seven easy to hang wallpaper panels. Activate each panel with water and apply one-by-one to the surface of your choice! Measures 10 1/2-feet wide x 6-feet tall when fully assembled.